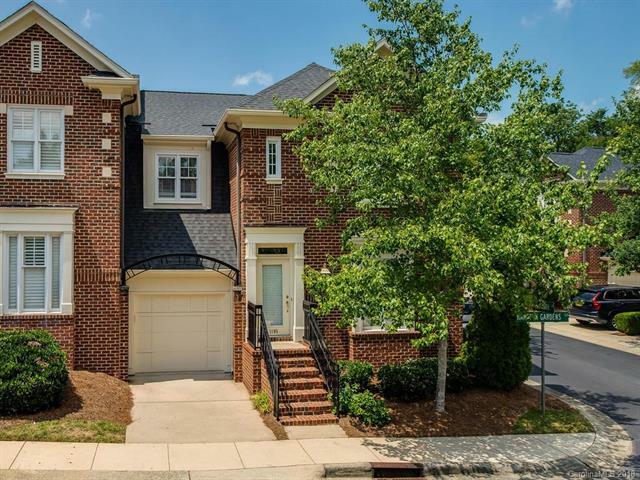 This beautiful two-story end-unit brick condominium has three bedrooms, two and a half baths and an abundance of custom upgrades. This open floor plan condo has engineered wood floors on the main level, ceramic tile floors in both full baths, crown moldings in the main living areas, custom closet systems thru-out, security system, 2 wood blinds thru-out, custom silk draperies thru-out. A new wine bar w glass front overheads, maple cabinets, granite counter/tumbled stone backsplash w wine under counter refrigerator was added to the LR/kitchen area. Granite counters were added to both upstairs baths. The kitchen features maple cabinetry w custom tumbled backsplashes and Corian counters. All kitchen appliances have been upgraded and are stainless including gas stove and cooktop, microwave, dishwasher, refrigerator, garbage disposal and a separate pantry. All plumbing and hardware has been replaced t-out. Home has gas heat, gas hot water heater and gas stove/cooktop. Electric air.